Chris came all the way from Rhode Island to fish for Stripers with Anthony today. Anthony took Vinnie from Ferguson Ent. out on a very cold Monday to see what the cold front did to the Stripers. 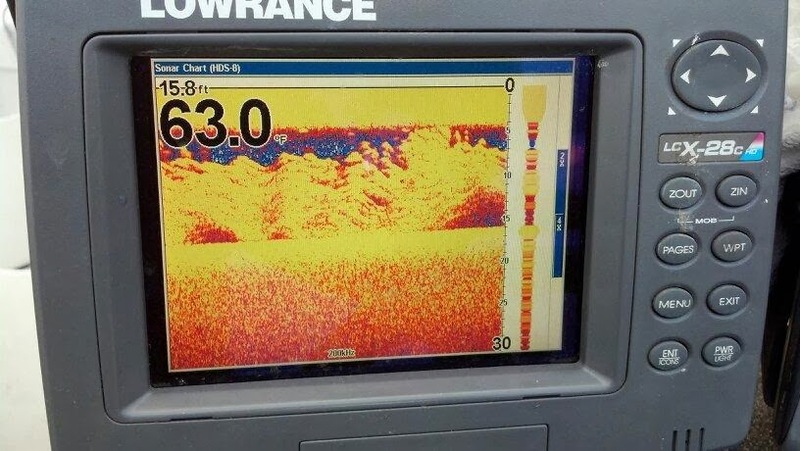 By the looks of these two fish it looks like the front turned bigger Stripers on. Vinnie wanted to take his jacket off so he could get his picture taken in his purple and pink polka dotted shirt but it was a little to cold for that. DP took off work a little early today so we went out for an afternoon of Striper catching. The weather was perfect for fishing for Stripers, cloudy and cold. After spending a couple hours catching the right bait we set out a spread of boards and pulled them for about an hour taking a dozen hits but boating only 3. DP and I decided to discard all the baits on the lines, go catch some more and relocate which we did. The move paid off immediately. We had almost got all of our baits out when the action started and it was tough to keep up with the fish. We had four or five hookups over a rock pile but instead of turning around and hitting it again we simply kept going. We had steady action for 2 hours straight, constantly baiting and reeling in fish. We kept the first dozen and threw back all the other fish we were catching. 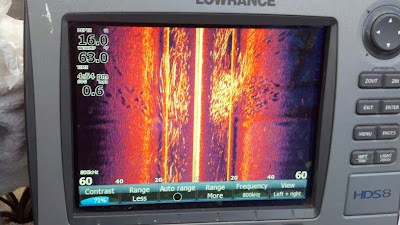 It is hard to tell by this picture but these were some very nice Stripers. This stringer weighed over 80 pounds! This was a special day for Billy, he played hooky this afternoon from work [ Tires Unlimited ] and enjoyed his 52nd birthday on the water reeling in fish. His shoulder and arms were burning the last 6 or 8 fish that he reeled in. Billy will definitely remember this birthday. 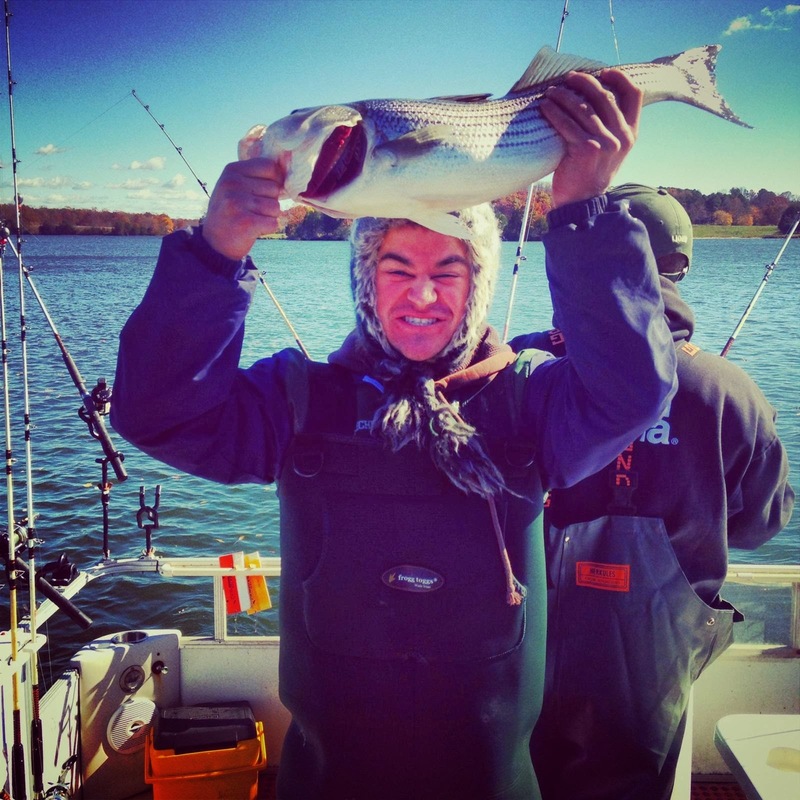 Today Guide Brian Mohr took Eric out for a half day charter and put him on a bunch of Stripers. Here are a few of their catch. Fishing continues to be very good even after the rain from last night blew out and the bluebird skies blew in. This morning fish were feeding everywhere. As I was going to catch bait we would see fish and throw lures at them, catch a couple 22 inch fish, run a half mile, see fish, cast to them, catch a couple more 22 inch fish till I realized all we were going to catch on lures were punks so we left them and caught some nice baits. Now the fish were in trouble. We had run about 3 miles to get to the bait with fish everywhere so I put out my spread and pulled the three miles back. We didn't make it quite all the way back before we had gone through the 50 baits we had caught earlier. It was now 10:30, the wind was howling and Earls arms were sore from reeling in fish. He is holding a stringer of the first 8 fish we caught this morning. We lost count of how many we caught because at times we would have 4 or 5 fish on at a time. We would simply boat the fish, throw it overboard then reel in another till we had no lines in the water. Just a killer morning of fishing on Lake Anna. 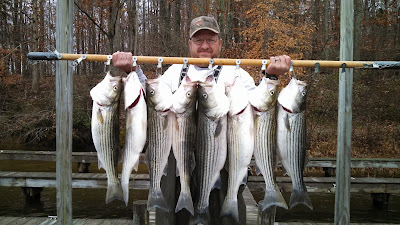 Anthony spanked the Stripers again today, 'tis the season for good catches. are going to get Bigger. Guide Anthony put Doug on some great fish today. These are only a few of the ones they caught, all others were released to fight again. These are the first eight fish of the day weighing 60 pounds. I bet if they could have culled their catch today they would have been closer to 80 pounds. Nice Fish! Another tough day for bait this morning for us, we had to throw for 5 hours to catch the bait we wanted. Once we caught the bait we set them out and started hooking up immediately. On our first pull we had 6 or 7 on but only landed a couple of them. We fished for about 2 hours then decided to go catch some more bait and try someplace different. This time bait was easy, a couple throws and we were ready. We put out a spread of boards and the fish wanted them. Although we did not start fishing till 10:30 we had plenty of Striper action. Sunny and Cool, Water Temperature 56* and Clear. We threw for bait this morning for about 2 hours before we had enough baits to start fishing. We put out a spread of boards working ledges and took 3 or 4 quick hits. We kept on going taking strikes but the fish were not very aggressive so we would only hook up with about half of them. We decided to go catch some more bait which was a mistake. After throwing for about an hour we hung up two nets and ended up having to leave them in the lake. We took what we had and set up in a different area pulling shallow flats but after an hour with only one fish we had to go. Again we caught more bait and I set up nearby where we caught the bait. The bait was the right size and the fish could not resist them. Within 30 minutes we had more action than we did the whole day. Jim and Ed had been out with me many times and had been patient throughout the day knowing what could happen and it did. It ended out being a great day on the water with some good old clients. This is a school of Stripers [the wide arches] that had surrounded a school of Gizzard Shad [the smaller dashes in the middle of the blue down scan screen] and were feeding aggressively. Here we have school of bait up on a point with Stripers feeding just off of the drop off. The Stripers eventually moved up onto the point and chased the bait up onto the surface busting bait in about a half acre area. We banged them on planner boards here. This is a picture of us throwing for bait. The left screen shows Large Gizzard shad. 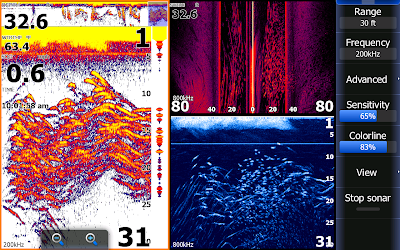 Side scan [upper right] shows the bait better on the right side because the net is falling down and into Giz on the left side spooking some of the bait. 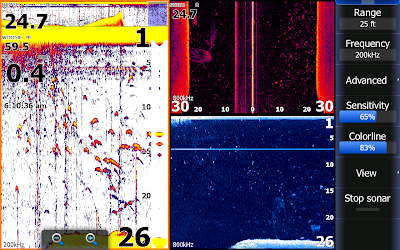 The net can be seen with bait inside of it on the center left side of the side scan and 16 to 22 feet deep on the down scan. This also demonstrates how a net collapses as it falls. When the net hit the water it was fully open [10' radius opened to 20 foot circle] then as it falls the weights sink faster than the material causing the net to collapse. 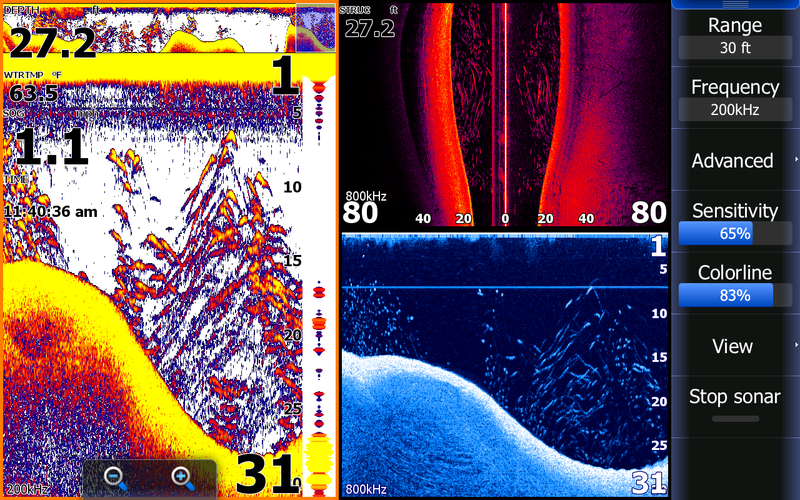 If you had a longer rope the net would eventually close completely, making catching bait in deep water very difficult. Cloudy and Warm, Water Temperature 58* and Clear. Today felt like a special day. Being cloudy and the weatherman calling for rain I expected boat traffic to be minimal but the sweet thing that happened today was that we had a tank full of bait before daylight which would allow us to be fishing at the crack of dawn. We put out a spread of baits and started taking hits immediately. The action continued for about 3 hours then the wind turned from the SW to the NW. Well you might as well been fishing with no bait on your hook because the fish turned off and would only roll the baits, they were still there but not eating. It didn't matter much because we had our limit and wanted to get in before the rain hit. 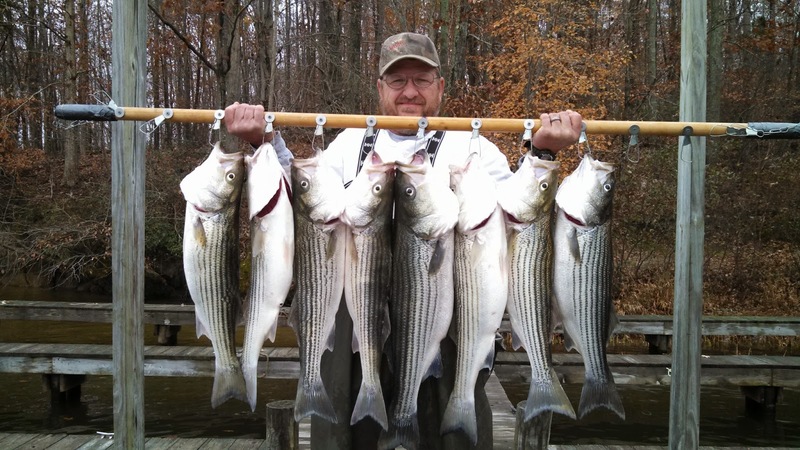 Jerry has been watching my posts on this journal and was dieing to get out and try it so today was a special treat for him to catch Stripers on Lake Anna with his son Michael. Sunny and a Beautiful morning, Water temperature 56* and Clear. Marc had some management over to his lake house to do some work for a couple days and wanted to cram a few hours of fishing in between some of the conference calls so he booked us for a morning trip. They worked a little after breakfast then got in the boat and fished for a couple hours before having to get back to eat lunch before more conferences. They kept these fish for a nice dinner tonight and hopefully the break they had out on the lake this morning was some good R and R for them. Today the weather and scenery on the lake was breathtaking. DP took Nick and Tom out this afternoon and put them on these nice Stripers. The Stripers are jamming Big Gizz now. Guide DP took a crew yesterday and these are a coupe pics of the day. Mike Migliorini took his son Cole and some of his buddies out to celebrate Cole's 18th birthday. 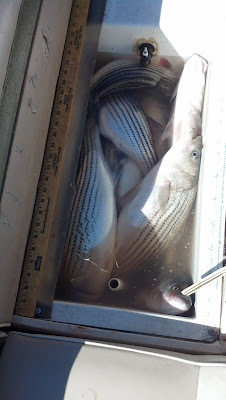 Despite being 2 hours late getting to the boat ramp (too much cake and ice cream late last night), the guys managed to catch some nice stripers. Today's conditions were tough but we all had a great time. Here is Drew with one of his fish and the other pic is a shot of the live well that one of the guys took. Yesterday [Saturday] morning DP and his son were up in a tree stand watching deer casually walk by. Anthony told his dad that he would like to go catch some Stripers so a few hours later they were out on the lake. 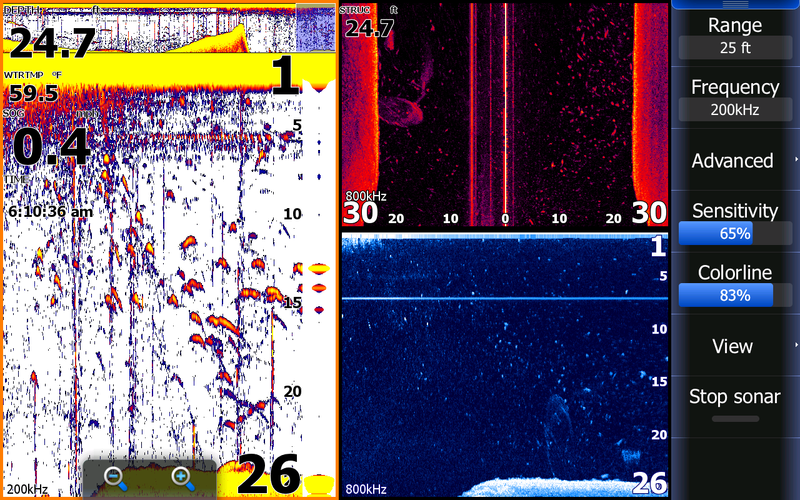 After catching bait DP found what is pictured on the Lowrance pictures and hooked up with the fish that are on the stringer. It didn't take but a couple minutes to limit out. I am sure Anthony slept good last night. What a memorable day for father and son.